Good afternoon LOVEanese! I have some updates and news to share before I get into the topic of this post. The first, and most exciting, is that today is the 1 month anniversary of LOVEanon! And as of 5:35 PM, it had 2,023 page views! Thanks to everyone who made this possible, and for all of your sharing and support. I really do appreciate it! Secondly, I've decided that I am going to be limiting my posts to once (or occasionally twice) per week. I don't want to overload people with content, and I also want to foster discussion on each post before moving on to the next one. Third, just an FYI in case anyone was wondering, I use the American Sociological Association's (ASA) style-guide for referencing (not APA). I apologize for not indicating that earlier. More info on this style is available here and here. So with all that out of the way, let's get into this topic. It's the second part of the Theory of Love series I started a couple weeks ago with the first post on the 6 Love Styles all about love, interpersonal relationships, and understanding the social scientific literature available about the nature of love. These theories are very loosely connected, but are for the most part independent of each other. They are able to exist apart from the other theories because they do not necessarily build on each other. This time around, I want to introduce one of my favorite theories, Robert J. Sternberg's (1986) Triangular Theory of Love. Sternberg's theory is intended to shed light on the questions of "What does it mean "to love" someone? Does it always mean the same thing, and if not, in what ways do loves differ from each other? Why do certain loves seem to last, whereas others disappear almost as quickly as they are formed?...This tripartite theory deals both with the nature of love and with loves in various kinds of relationships." (Sternberg, 1986: 119). Intimacy (The Emotional Warmth): "The intimacy component refers to feelings of closeness, connectedness, and bondedness in loving relationships" (Sternberg, 1986: 119). For him, these are the feelings that give warmth, comfort, and emotional connectedness. Passion (The Romance/Attraction): "The drives that lead to romance, physical attraction, sexual consummation, and related phenomena in loving relationships" (Sternberg, 1986: 119). This is the sexual and attraction side of love. Commitment (The Togetherness): This "component refers to, in the short term, the decision that one loves someone else, and in the long term, the commitment to maintain that love. The commitment component thus includes within its purview the cognitive elements that are involved in decision making about the existence of and potential long-term commitment to a loving relationship" (Sternberg, 1986: 119). This is the dedication/loyalty side of love. According to Acker and Davis (1992: 21), among their sample, "commitment was the most powerful and consistent predictor of relationship satisfaction, especially for the longest relationships." You can check out a brief description of each here. Bear in mind the labels that are given to each of these are value-neutral, so infatuation, for instance, merely implies that there is much passion (i.e., sexual and romantic attraction), but no emotional intimacy or commitment. Each of these combinations represent different manifestations of love, and they can all appear in different stages of relationships. 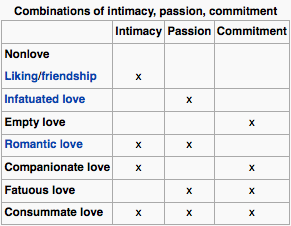 Notice how they also compare to Lee's 6 Love Styles in terms that you can draw certain parallels (for instance, Companionate love is like Storge love). Also, it is very normal to experience these different forms of love with people besides a romantic partner. For instance, you may have Intimacy or Companionate love with a family member, friend, etc. Something great about this theory is that it incorporates many different aspects of love into one theory, and fairly straight-forward. It's very intuitive, easy-to-understand, elegant, flexible, and the words he uses are words that correspond to their common meaning. So when he says romantic love, he means it in exactly the way we imagine: a lot of sexual and physical attraction, and high levels of emotional disclosure, but in this sense, he defines it as not including a lot of commitment (and in this way, it diverges from Lee's concept of Eros for instance). Now... here's the important part: how can you use this? First of all, this is primarily geared towards couples who are in a romantic relationship. It's not as useful to singles. Second this theory is that it's trying to understand how love presents itself. So it's not necessarily describing specific behavior, nor is it really about self-improvement per se. It's really mostly about understanding. Of course, Sternberg would probably argue it's a theoretical foundation for understanding and contextualizing love scientifically. But there are shortcomings to that, such as it doesn't take into account how they develop, or the social influences. Moreover, later in an article he co-authored, they argue that love is a social construction (Beall and Sternberg, 1995). This is interesting because if you consider the questions that his theory is supposed to answer (or at least try to answer), they are faced with a contradiction that the nature of love is socially and culturally constructed, thus they can't REALLY be answered or placed into neat boxes of description. This is particularly important if you consider the different emphasis that is placed on each of the three components by different cultures. Arab culture, for instance, places a higher value on commitment than it does on Intimacy or Passion. A very interesting thing to note too is that where you and your partner lie on the triangle, or which triangle is most applicable to your relationship may not be (and often aren't) the same. So while you feel we have all three components, your partner may feel like you have only 2. And this is problematic. Understanding where you fall on the triangle is important to understanding your relationship better. Where exactly do you fall? If you're in a relationship, check out this test. It draws on Sternberg’s Triangular Theory of Love Scales (which have been validated (e.g., Hendrick and Hendrick, 1989; Sternberg, 1997)). If you want more information, you can check out his research yourself, or check out this PDF. What do you think? Where do you stand in your relationship? Acker, Michele, and Mark H. Davis. 1992. 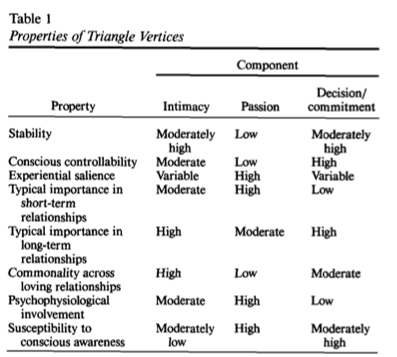 "Intimacy, Passion, and Commitment in Adult Romantic Relationships: A Test of the Triangular Theory of Love." Journal of Social and Personal Relationships, 9(1): 21-50. Beall, Anne E., and Robert J. Sternberg. 1995. "The Social Construction of Love." Journal of Social and Personal Relationships, 12(3): 417-438. Sternberg, Robert L. 1997. "Construct Validation of a Triangular Love Scale." European Journal of Social Psychology, 27: 313-335. ----. 1986. "A Triangular Theory of Love." Psychological Review, 93(2): 119-135. On the eve of its one month anniversary, I'd just like to say that LOVEanon beats any and all love/relationship advice I've ever read in any and every women's magazine. The weird (and awesome) part is that you do this without pretending to prescribe solutions or offer cliched advice. As a self-proclaimed women's-mag quiz addict, I absolutely love the links to the tests. But what really sets this blog apart is the fact that you provide contextual background first. You successfully present and decode, in accessible language, leading theories on love and relationships that most of us would never seek out or even stumble upon accidentally. As a non-singleton who thinks she knows absolutely everything about my partner and our relationship, I find your posts enriching, entertaining, and sometimes downright enlightening. No matter their content or mood, they keep the dialogue going and keep me conscious of something that is so easy to take for granted. Margot: Thank you, I'm glad you liked it! Great post :) I am surprised that you've been blogging for such a short time! This blog post is very useful to singles as well as it helps us decipher previous relationships, how they made us feel, and why we have chosen to stay in them. Everything is related. You are definitely right, it might not be applicable to a current relationship, but it's helpful to understanding the past and the future. I do think that understanding your past relationships, why they didn't work, what you learned from them, and how they've influenced what you want now is really important. Thank you P. for reading!